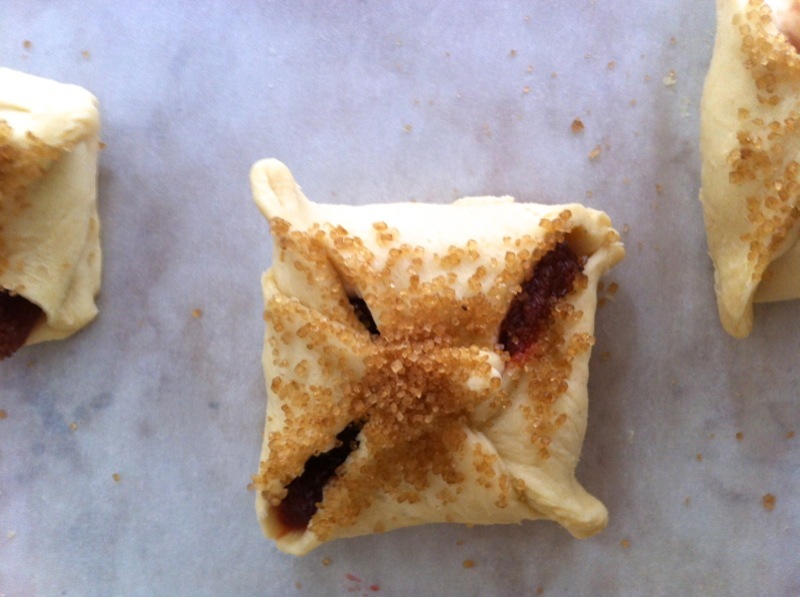 I love making these quick danishes for brunch or an afternoon tea, or to take along when a friend invites us for dinner. It just needs a couple hours of forethought to take the cream cheese out of the fridge and let it come to room temperature. Start to finish, though, the assembly and baking takes less than an hour. 1. let cream cheese sit until room temp. mix with lemon zest, vanilla, sugar (and cinnamon, if you want). one full packet of cream cheese is enough for two packets of dough. (the cream cheese mixture will keep, and you can make a second batch with cold cream cheese straight from the fridge). a note about lemon zest: in dishes where the flavor will come through (like dips or dairy-based things), I always use zest whenever the recipe calls for the juice. if it would just be a waste to add zest, I zest it anyway and keep it in a little baggie in the freezer, moistened with fresh lemon juice. this way, I can just add zest to things even if I don’t have any fresh lemons. 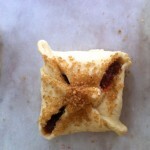 2. unroll crescent roll dough. cut vertically and horizontally in half so you have four rectangle/squares of two triangles each. break apart the two triangles and then overlay one piece on top of the other, overlapping, and mash the seam together so that the filling won’t spill out. 3. cut each of these in half, so you end up with eight squares. 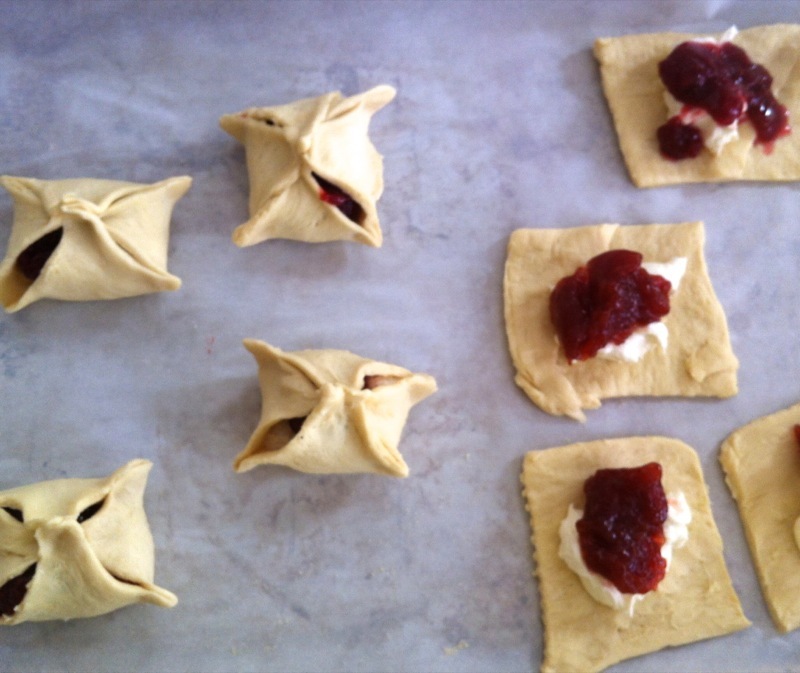 stretch them out into a square-ish shape if they are a little misshapen. 4. for each square – put a teaspoon-sized dollop of cream cheese in the middle, then a dollop of jam. (my absolute favorite is crofters fruit spread). 5. pull up opposing ends of each square into the middle and squish together, then kind of pull at the four corners so you get a little square packet. sprinkle with turbinado sugar. 6. bake at 375 for 17-20 minutes until golden brown. check at 17 – if there is any stuff oozing out, just use a nonstick spatula to kind of scoop it up and back onto/into the danish. jzk for sharing this recipe! looks and sounds so yummy! 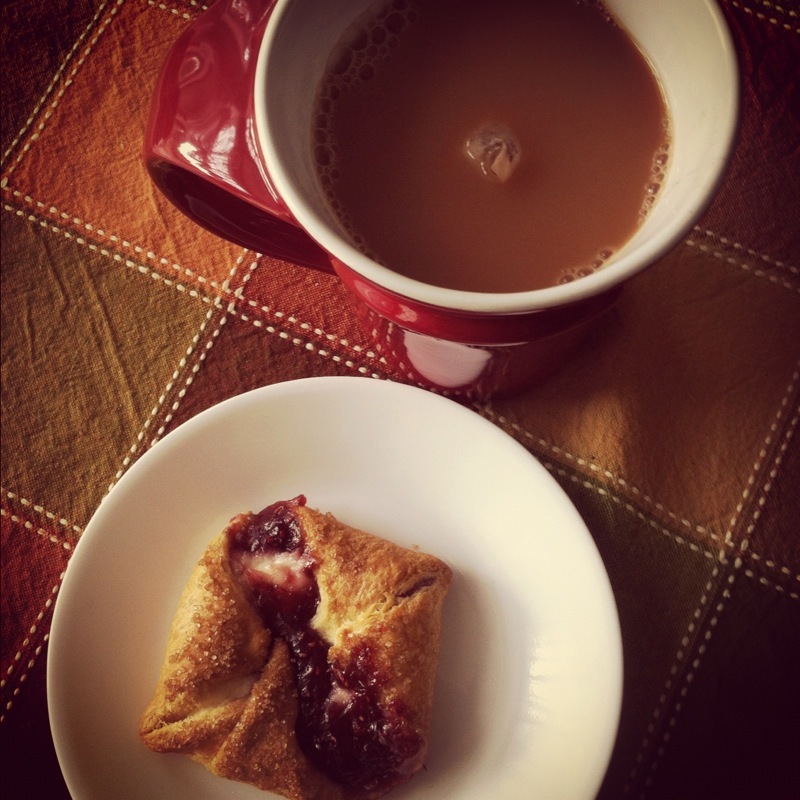 just the perfect treat to have with tea. i just wanted to ask you two things before trying this out. Zainab – any dough that calls for a lot of butter, with the dough folded over onto itself in layers, will produce a flaky danish dough. try this one: http://www.joepastry.com/category/pastry/danish-pastry/. Turbinado sugar is a crunchy brown sugar – what you’d call normal sugar in Pakistan :). The sugar here is ground superfine, and we have to buy crunchy, large grain sugar specially.